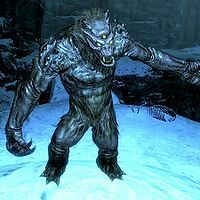 The Udefrykte is a unique frost troll found in the ice cave portion of Dawnstar Sanctuary during the Dark Brotherhood quest The Cure for Madness. The Udefrykte has a set level of 22; therefore, it may be advisable for lower-level characters to sneak past it. If the player plans on taking on the Udefrykte, strong fire spells, scrolls, or a weapon with a strong fire enchantment are recommended. Like all other trolls, it has the ability to regenerate health over time, so it is better to kill it as quickly as possible without giving it a chance to heal significantly. Other creatures similar in concept and spelling include the Udyrfrykte from Bloodmoon, and the Uderfrykte Matron from Oblivion. This page was last modified on 19 May 2015, at 19:27.